COLAVIZZA, Giovanni ; KAPLAN, Frédéric. 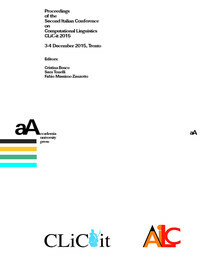 On Mining Citations to Primary and Secondary Sources in Historiography In : Proceedings of the Second Italian Conference on Computational Linguistics CLiC-it 2015 : 3-4 December 2015, Trento [en ligne]. Torino : Accademia University Press, 2015 (généré le 23 avril 2019). Disponible sur Internet : <http://books.openedition.org/aaccademia/1439?nomobile=1>. ISBN : 9788899200008. DOI : 10.4000/books.aaccademia.1439.